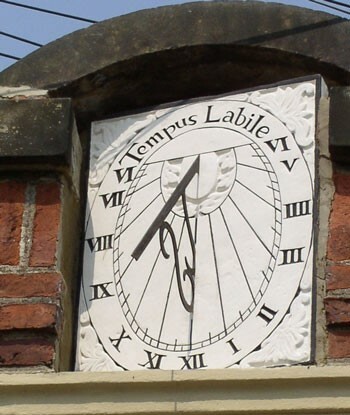 On Friday 12th May – a gloriously sunny morning – Bishopthorpe’s restored 17th-century sundial was fixed back into its ni che on the Co-op store. It was last November that sun-dial restorer, Harriet James, took the York-stone dial down to her Wiltshire workshop. There she stripped off many layers of flaking paint and limewash. Harriet re-painted it, imitating the oldest white/cream layer and picked out the carved detail in black to ensure legibility. Harriet had found the sundial to be generally in good condition with the carved numerals worn, but of good quality. The corners of the dial, however, had to be re-formed using epoxy glue and ground stone. Also, the iron gnomon (shadow caster) was badly rusted and could not be saved. Harriet had a replica made from brass. 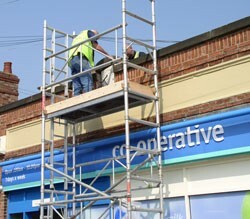 The restoration was funded by United Co-operatives Ltd. and will be officially unveiled on Thursday, 18th May at 11.00 a.m. The sundial has been angled out from the wall in order to tell the correct, local, solar time. It was found that the sundial was designed to face due south, but the facade it is fixed to faces 15 degrees to the east of south. 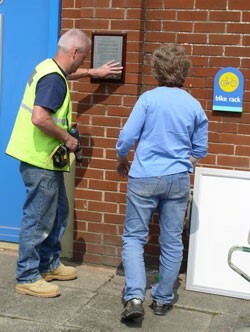 Harriet James and a Co-op employee fix the plaque to the wall. This gives details of the sundial including how to read the time.